The BME Wrist Pin brand, introduced in 2000, has grown to three wrist pins. This comprehensive product line covers every conceivable motorsports application. Image: Bill Miller Engineering, Ltd. The wrist pin is one of the most highly-stressed parts in a racing engine. Burning gases, expanding in the combustion chamber, exert tremendous pressure on the piston top. The wrist pin, a short-length of thick-walled, tubular steel, transfers that impact to the connecting rod. That force is a crushing, 65-tons and, at 8400 RPM, it smashes the wrist pin about 70 times a second. Wrist pins in a 10,000-hp, supercharged, nitromethane-burning drag racing engine are subjected to extreme levels of bending and radial stress. Few raw materials have the incredible strength required by wrist pins in a nitro-class engine. Bill Miller Engineering Wrist Pins for blown-fuel Dragster and Funny Car engines are made of VascoMax C-300, a costly "superalloy" which has the high-strength, toughness and durability necessary in a wrist pin for a supercharged, nitromethane-fueled application. 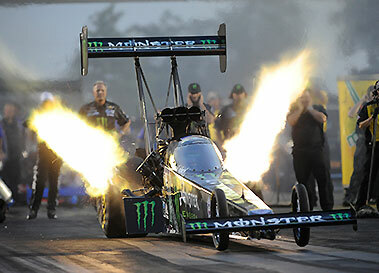 Probably the most brutal application for a wrist pin is the 10,000-hp, supercharged, nitromethane-fueled engine in a Top Fuel Dragster, such as that driven by Brittany Force. Image: Auto Imagery. The VascoMax family of nickel-cobalt steels was introduced in the early 1960s by Vanadium-Alloy Steel Company (Vasco) for use in large, solid-fuel rocket motor cases being jointly-developed by NASA and the U.S. Air Force. Today these alloys are used in a variety of exotic aerospace, industrial and motorsports applications which require extremely high levels of strength, toughness and wear resistance. Vasco-Max C-300 is made using a technologically-advanced "double vacuum melting" foundry process. The first part is "vacuum induction melting" (VIM) which uses an airtight refractory vessel, or "crucible", subjected to a vacuum. This vessel is surrounded by a water-cooled copper induction coil. The metals to be melted are placed inside the crucible. Alternating current is passed through the induction coil which creates a magnetic field that inductively heats, then melts the metal. Once all the metals which make up the alloy are blended, the vessel is unsealed, then tilted such that the molten metal flows into a "pouring box" and from there into cast iron molds where it cools into ingots. 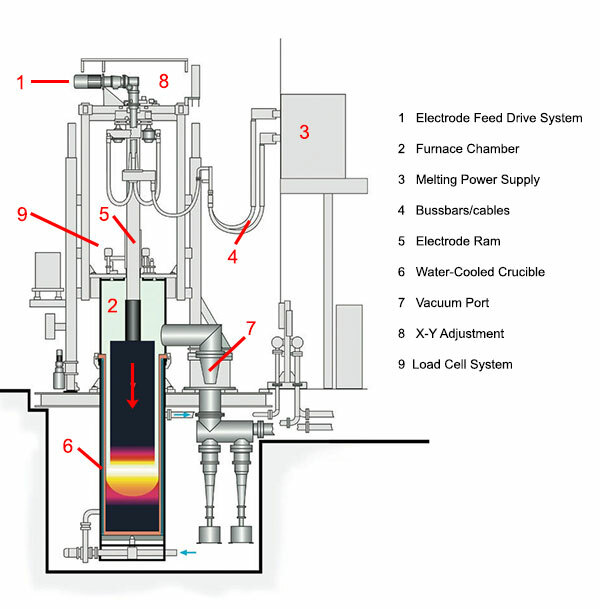 The second step is "vacuum arc remelting" (VAR). A VascoMax C-300 ingot is placed in a water-cooled, copper crucible. The crucible is sealed, a vacuum is applied, then high-amperage, DC current is applied to an electrode inside the crucible. Arcing between that electrode and the ingot remelts the steel and the molten metal "drips" into a pool at the bottom of the crucible where it hardens into an ingot. The vacuum prevents contamination resulting from molten steel reacting with the atmosphere and any gas bubbles released during remelting are drawn off by that vacuum. The result is an ingot with outstanding internal structure and excellent chemical homogeneity. The foundry heat treats the metal, then hot works ingots of VascoMax C-300 into round, steel bar stock. What makes VascoMax C-300 desirable as a raw material for Top Fuel and Funny Car engine wrist pins is very high ultimate tensile strength of 294,000-psi and an extreme fatigue endurance limit of one billion cycles at 125,000 psi. loading. The strength and durability of a BME Vasco-Max Wrist Pin comes as much from the processes used to manufacture it as it does from its raw material. A section of Bill Miller Engineering's Carson City, Nevada manufacturing plant is equipped with CNC turning centers devoted solely to BME Wrist Pin production. The CNCs cut Vasco-Max C-300 bar stock into sections, precisely machine the inside and outside diameters then cut and grind the pins' ends. After machining in the CNCs, BME applies a unique, mirror finish to the inside and outside surfaces of each pin. 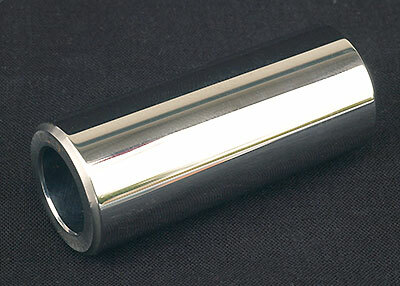 Only a handful of companies in North America have the ability to do that and, as a result, BME Wrist Pins for drag race engines have a mirror finish, an unusual, high-quality feature which adds an additional margin of reliability and durability. One of the first nitro class racers to use the BME C300 Vasco-Max Wrist Pin was 16-time NHRA Funny Car Champion John Force. He continues to put BME Vasco-Max pins in all the engines used in John Force Racing race cars. Image: Auto Imagery. In blown-fuel racing, who's using Bill Miller Engineering's killer, VascoMax Wrist Pins? 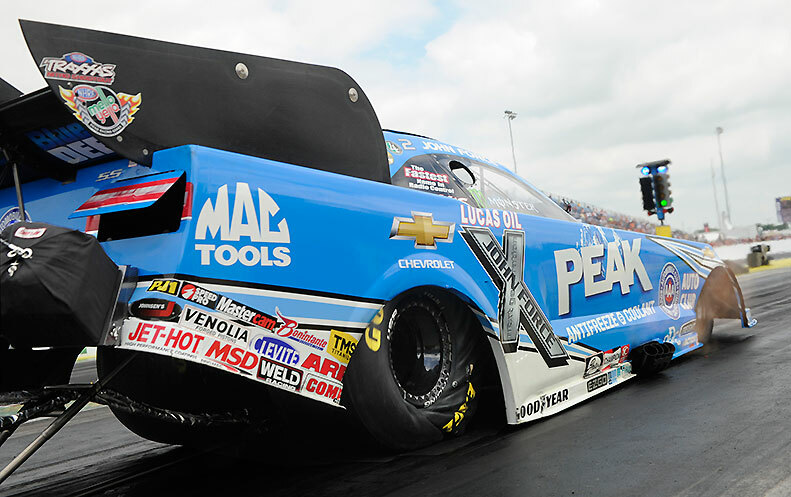 Most of the big names in the sport including: Eight-time Top Fuel Champion, Tony Schumacher and 16-time Funny Car Champion, John Force. During 2014, 90% of the 20 race teams which make up the top ten in the National Hot Rod Association's two nitro classes, Top Fuel and Funny Car, used BME Wrist Pins. In fact, with the nitro Funny Cars, BME's Pins totally dominate the sport with all of the Top Ten in 2014 having used them. This is the front engine in the Challenger 2. Both the C2's 3500-hp BAE Hemis use BME VascoMax Wrist Pins. Image: BME Ltd.
Obviously, the nitro class drag racers rave about BME's VascoMax Wrist Pins, but so do Bonneville record holders who go even faster. Southern California Timing Association (SCTA) National Records at Bonneville Salt Flats, Utah, are an average of two runs, one each direction. During each run, the car accelerates for five miles with the last two of those five a speed trap. After the fifth mile, there are two miles left to stop. 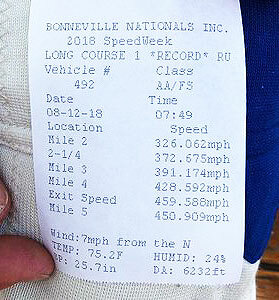 On 21 August 2016, Danny Thompson set the SCTA AA/Fuel Streamliner National Record at 406.769-mph driving the twin-engine, all-wheel-drive "Challenger 2". In the "C2" are a pair of 500-inch, Brad Anderson Hemis. Each is fuel-injected, burns 72% nitromethane and produces 3500-hp. For the performance, reliability and durability needed to produce a sustained, 7000-hp for 10 miles or more, both engines are equipped with BME VascoMax Wrist Pins. Three weeks later, Thompson was back at the Salt with the BME-equipped Challenger 2 to try for an Federation Internationale de l'Automobile (FIA) World Record in Category A, Group II Class 11. Interestingly, back in 1959, Danny's Dad, Mickey, famed drag racer and land speed racer of the 1950s and '60s, set a 345.330-mph record in the same FIA class with the "Challenger", a four-engine, 2100-hp streamliner. Early morning, 16 September: running against an existing, 414-mph record, Danny came oh-so-close. At 413-mph, both rear tires blew. Thompson got the C2 stopped safely but the tire failures ripped the rear driveshaft out of the car and damaged the body, so hopes for a World record in 2016 were dashed. At Bonneville in 2017, on his first run, Danny went 439-mph, but he could not back-up that speed. On the second run in the opposite direction, one of the engines failed ending "DT's" Bonneville racing that year. A year later, 11-13 August 2018, Thompson took the Challenger 2 to Bonneville one last time and, finally...success. Danny made two runs in the BME-equipped, streamliner. The first was 446.605-mph. The second was 450.909-mph. The two-way average was 448.757-mph: a new land speed record in SCTA AA/Fuel Streamliner making the Bill Miller Engineering Vasco Max Wrist Pins the fastest pins you can get. The second product in Bill Miller Engineering's Wrist Pin line is made from heat-treated, AISI S7 chrome-moly tool steel. The BME S7 Pin is a less-costly alternative to the Vasco-Max Pin and is ideal for supercharged-alcohol or -gasoline engines in Pro Mod class racing where the power output is in 3000-5000-hp range. S7 Tool Steel is BME's choice for its mid-market wrist pin product because of not only its strength but its exceptional wear-resistance. Team Jegs' two Pro Mod Vettes, driven by the father/son pair of Troy Coughlin and Troy Coughlin Jr., use engines from Pro Line Racing which puts BME Wrist Pins in every engine they build. Inside a 3500 horsepower, turbocharged, Pro Mod engine, a force of 30 tons hammers each wrist pin about 70 times each second. 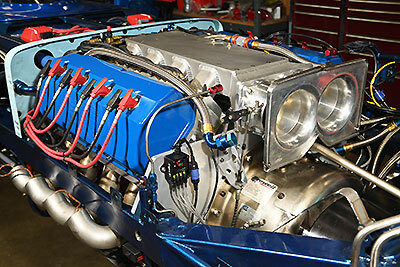 According to engine builder, Pro Line Racing, a Bill Miller Engineering S7 Wrist Pin in one of their 540 inch, 8500-RPM Pro Mod engines is changed every 4 or 5 rebuilds, or about 200-300 passes. One reason to choose Wrist Pins from Bill Miller Engineering is this unmatched durability. Bill Miller Engineering's final wrist pin offering, the BME 9310 VAR Pin, grew out of Bill Miller's interest in manufacturing a wrist pin which meets the reliability and durability challenges in racing engines used in a majority of motorsports, but is a better value than other pins on the market. Since the 9310 Wrist Pin was introduced a dozen years ago, racers in the Pro Stock and sportsman drag racing categories along with road racers and stock car racers have been switching to them. The BME 9310 Wrist Pin begins with 9310 vacuum-arc-remelt steel, a raw material with the purity and strength necessary for wrist pins used in Pro Stock and other unblown or supercharged race engines making up to 3000-hp. BME's 9310 VAR is, also, a material which is more cost-effective than some of the more exotic alloys used by other manufacturers selling wrist pins to the "under-3000-hp" market. 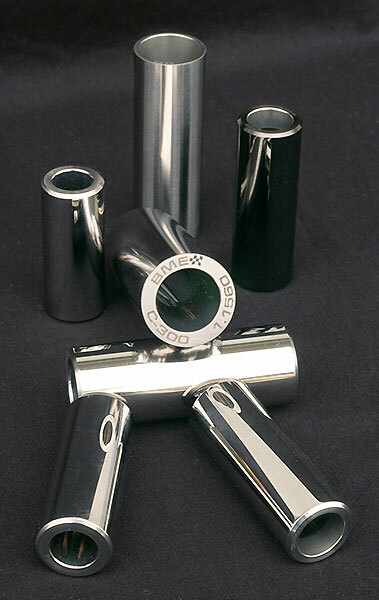 Once 9310 bar stock arrives at Bill Miller Engineering, like the VascoMax and S7 Tool Steel Wrist Pins, the 9310 VAR Pins receive BME?s special manufacturing processing which gives their O.D.s and I.Ds that distinctive, high-quality, mirror finish. With the Bill Miller Engineering Wrist Pin line, once again, aggressive pursuit of quality pays off with products which are reliable, durable and perform beyond the expectations of the racers who win with them. A VAR steel is melted twice. Conventional foundry processing produces an ingot of 9310 steel. The ingot is placed in a water-cooled, copper crucible. The crucible is sealed, a vacuum is applied, then high-amperage, DC current is applied to an electrode inside the crucible. Arcing between that electrode and the ingot remelts the steel. The vacuum prevents contamination resulting from molten steel reacting with the atmosphere and any gas bubbles released during remelting are drawn off by that vacuum. The result is an ingot with outstanding internal structure and excellent chemical homogeneity. The foundry then processes ingots of 9310 VAR into round, steel bar stock. The strength and durability of a BME Wrist Pin comes as much from the processes used to manufacture it as it does from its raw material. A section of Bill Miller Engineering's Carson City, Nevada factory is equipped with CNC turning centers devoted solely to Wrist Pin production. The CNCs cut 9310 VAR bar stock into sections, precisely machine the inside and outside diameters then cut and grind the pins' ends. After rough and final machining in the CNCs, BME applies a unique, mirror finish to the inside and outside surfaces of each Pin. Only half a dozen companies in North America have the ability to do that and as a result, BME Wrist Pins for drag race engines have a mirror finish, an unusual, high-quality feature which adds an additional margin of reliability and durability. Pro Stock and Pro Mod are not the only form of competition in which racers can gain reliability and durability from Bill Miller Engineering 9310 VAR Pins. They've become quite popular in Comp Eliminator, Super Stock or other types of racing where normally aspirated, nitrous oxide injected or even supercharged race engines are used. One of our favorite BME-equipped, Pro Line Racing powered Pro Mods is this early Camaro.